How important is ritual? I’ve come to realise that, for small people, it is essential. It’s their way of marking the weeks that pass on a calender that they don’t yet understand. In a cottage that has no time for organised religion, especially of the Catholic variety, we make our own simple rituals, often revolving around food. For the Husband and his four sisters, childhood Sunday supper was always egg-in-an-eggcup. Once discovered, this was a meal that I seized upon. Easy to scale up or down for kids of any age, with minimal preparation and washing up, part of the deal is the fact that he makes it. Plenty of sourdough toast soldiers, some cheese from Saturday’s market visit, oranges or apples to finish and it’s a wholesome antidote to any weekend of feasting. This meal, in Little Missy’s mind, has become inextricably linked with the family sitting down to Sunday night popcorn and a film. I only discovered how important this was when we were in New Zealand and I had to make sure we had a supply of corn at the ready to follow the boiled egg! Freshly from the pan and warm, popcorn is good already, but you can always gild the lily with a few sweet or savoury additions. These aren’t complicated – that’s not the point of a Sunday night – but I love to play in the kitchen and with some spice, a little sweetness and not too much salt it’s easy to keep everyone happy. Making rituals, one bowlful at a time. 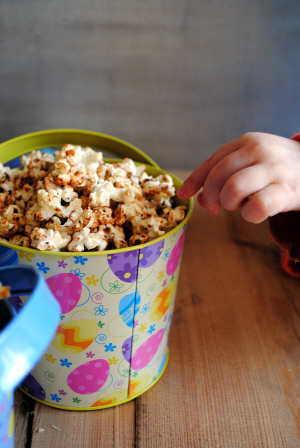 For the grown ups, we’ve discovered that beer and popcorn are a match made in heaven. Favourite combinations? Cut the richness of plain buttered or the maple and cinnamon with some light, hoppy Barefoot Bohemian Pilsner and counterpoint the smoked paprika with a glass of sweet Sunburnt Irish Red. Put a heavy-based pan with a lid over a medium heat. Add the oil and corn and heat, shaking occasionally, until it starts to pop. Clamp on the lid, turn up the heat and shake constantly until the popping stops. Do not walk away, you will regret it! Tip into a large bowl and wipe the pan out with kitchen paper. Pop the butter into the hot pan and melt over a medium heat until it starts to turn brown. Spoon in the maple or orchard syrup, add the cinnamon and swirl while everything bubbles. 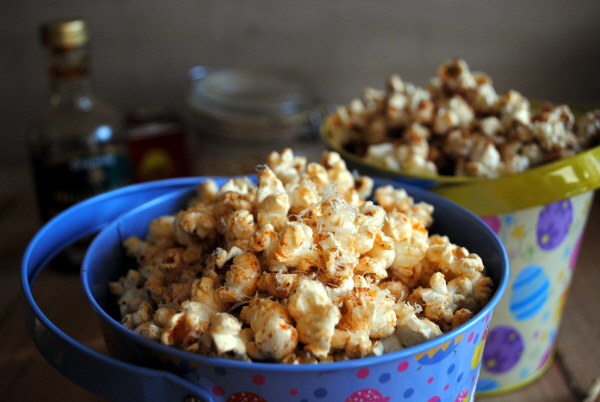 Tip the popcorn back into the saucepan with a pinch of salt and mix well. Put the sunflower oil in the hot pan with the sugar. Melt over a medium heat and add the paprika. Tip the popcorn back into the saucepan, grate over the parmesan and mix well. 50g popcorn serves this family of four, not generously, but there’s always just about enough. We had a popcorn tradition when I was a kid too. Popcorn was one of the only things my dad ever cooked (the other was weekend breakfasts). Now, me, Matt and the kids have homemade pizza and settle in for a movie on rainy Saturdays – though now that you’ve reminded me of the popcorn, I’m going to give your recipes a try this weekend. On Sunday nights when I’m not around, the Husband makes the popcorn – as I can normally tell by the slightly burnt pans the following morning! Little Missy doesn’t let him off the hook. Love the homemade pizza and a movie idea.